A hardy, natural, good-natured working breed that today is known principally as a faithful family companion. 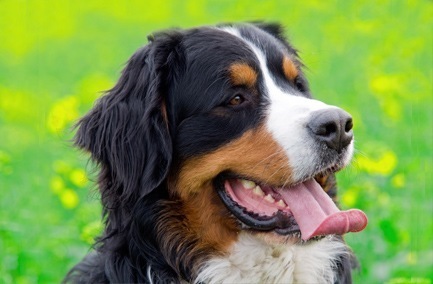 The Bernese temperament is one of the breed’s strongest assets. Consistent and dependable with a strong desire to please. Self-confident, alert, good natured. Attached and loyal to human family; may be aloof or suspicious with strangers, but never sharp or shy. Males: 24.4-27.6 inches (62-70 cm), Females: 22.8-26 inches (58-66 cm). The adult coat is thick, moderately long, possibly with a slight wave but never curly. It has a bright natural sheen. In texture it is soft rather than harsh, but is weather resistant, easily kept and resists matting. There is a soft, seasonal undercoat. Compulsory markings: Jet-black ground colour. Rich russet markings appear on the cheeks, in a spot over each eye, in a patch above each foreleg, and on all four legs between the black of the upper leg and the white of the feet.